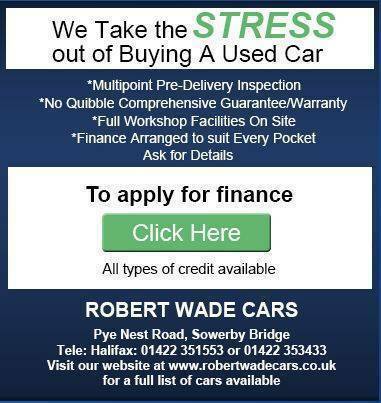 Here at Robert Wade Cars we pride ourselves on the very high standard of customer care which people throughout the area now associate with the "Robert Wade Cars" name. as existing customers will testify, forms the basis of our family owned business. Our membership of the 'Motor Trade Partnership' which is run by west Yorkshire trading standards is another assurance, if one is required, of our commitment to customer care. A commitment which recently resulted in us receiving the prestigious 12 Months Customer Service award from the West Yorkshire Trading Standards for an unprecedented 13th year running. We are also a member of the FSB (Federation of small Businesses) Mem No. 2053280. We hope you enjoy your visit to the Robert Wade Cars web site. We accept cheques, cash and all major credit cards except American Express.